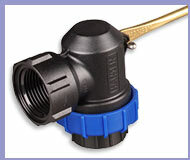 Each valve is supplied with: Complete Plastic Valve Body, Long Brass Arm, 650mm Cord and Nuts, Standard or Long Tail Glass Fibre Reinforced Nylon Adaptors as indicated above. Max Pressure @ 20°C = 12 Bar. Metric Sizes BSPT (DN). Imperial Sizes BSPT. Each valve is supplied with: Complete Plastic Valve Body, Brass Arm, Standard or Long Tail Glass Fibre Reinforced Nylon Adaptors as indicated above. The Super-Flo Valves in this website are protected by intellectual property rights owned by the Hansen group of companies in NZ and pending in other countries, including NZ patent applications 585472/585246 and NZ registered design 413594. HANSEN is a trade mark of the Hansen group of companies. Hansen Valves are rigorously hand tested using Water.